The Short- One of 2014’s biggest surprises, a nuanced performance from Keanu Reeves along with some of the most fluent and stunning action sequences to appear on film this year. John Wick is one of the most breathtaking B-Movie action flicks you will see this year with raucous violence and a fun cast. Action movies don’t normally come with loads of surprises, especially the PG-13 summer movie fare. They give the people what they want but very rarely does an action movie include redemptive qualities, an agreeable hero that lives in the gray area between hero and villain. It’s `a place where almost all of our great TV characters live but a role that Liam Neeson made popular in pretty much everything he has made in the last 10 years. This movie gets away from those PG-13 tropes by being a very hard R action flick, but the R rating is almost all for violence and language, Derek Kolstad’s screenplay calls for fun banter and brutal violence and that’s about all they have time for. For the films first 20 minutes we meet John Wick, a widower who lives a seemingly quiet life morning the loss of wife (Bridget Moynahan). While at a gas station he meets Iosef Tarasov the son of a Russian mobster (Alfie Allen of Game of Thrones ) who expresses interest in John’s car, but when John rebuffs his request to purchase his car Iosef and his buddies break into John’s house, beat him with a baseball bat, kill his dog that was a gift from his dying wife, and steal his car. Unluckily for them they did it to the most lethal (Now retired) assassin in the world, and thus begin the bloody fun ride that is John Wick. From there John Wick is a bloody and beautiful action movie, with first time directors David Leitch and Chad Stahelski whom have a background in stunt work (Both worked with Reeves on The Matrix series) and they use that stunt work and the previous relationship with the film’s star to their advantage. They somehow make the action films have video game fluidity to them, Reeves at times seems almost superhuman but thanks to Kolstad’s witty script that is exactly how we expect him to be. The films first 20 minutes are used generously to set up Wick as a man who has finally left that old life behind him but for this particular instant is making an exception. They also use that time to show just how connected John is, and where Kolstad’s script is at its most humorous when people begin to react at what these 3 idiots did. Whether it’s John Leguizamo’s character, a chop shop owner who punches Iosef when he sees the car he stole an act that would normally get him in trouble but when his boss Iosef’s father calls they begin to see the gravity of the situation they are in. The directors use all of that set up into one of the most entertaining action sequences you will find on film this year. As 12 intruders have broken in to John’s house to kill after his former and father of boss Mobster Viggo Tarasov (Michael Nyqvist) orders a hit on him, the scene turns in to one of the coolest shootouts we’ve seen since The Matrix. Leitch and Stahelski show off their skill as stunt men and the scene sets a precedent for the film’s final hour which is just as good if not better than any action film to hit theaters this year. 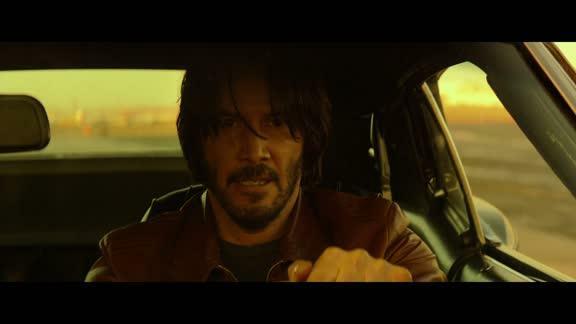 John Wick is not going to win any Oscars but Keanu Reeves deserves a lot of the credit for this movie’s success, considering the actors best movie since 2006’s A Scanner Darkly was his documentary Side by Side (it’s a fantastic doc for film nerds) it’s nice to see Reeves put some weight into his performance. He is the strong silent type but he has moments when people question his motives “All of this because a bleeping dog” is a quotation uttered more than once but it’s when Reeves gets the chance to voice why that he is at his finest. They don’t ask the former Matrix star to move mountains but he gives a nuanced performance that makes John Wick a better film. John Wick is just a bloody good time, beautifully shot action movie with plenty of breathtaking fight sequences that make it worth every penny. A nice cast including Dean Winters, Willem Dafoe, Adrianne Palicki, Ian McShane, and Lance Reddick all have supporting roles and they all do a pretty good job. Leitch and Stahelski do a bang up job of putting John Wick together, and along with Kolstad’s script they create a memorable above average action flick with real personality to add to its B-movie violence. As we begin the journey into Oscar season, John Wick is the ultimate pallet cleanser, after you see Birdman, Gone Girl, etc. John Wick may just be the next movie you see if all you are looking for is a good time. Starring- Keanu Reeves, Michael Nyqvist, Alfie Allen, Dean Winters, Willem Dafoe, Adrianne Palicki, Ian McShane, Lance Reddick, John Leguizamo, and Bridget Moynahan.